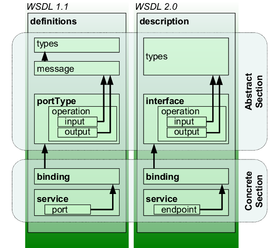 Web Service Definition Language in short WSDL is an XML format for describing network services as a set of endpoints operating on messages containing either document-oriented or procedure oriented information. XML document written to describe a web service. It specifies the location of the web service and the operations or methods the web service exposes. Types – a container for data type definitions. This describes the data. The XML schema Language(Known as XSD also) is used for this purpose. Message – an abstract, typed definition of the data being communicated. The contains the information needed to perform the operation. Operation – an abstract description of an action supported by a service. This defines the actions and the way the message is encoded. Port Type – an abstract set of operations supported by one or more endpoints. Binding – a concrete protocol and data format specification for a particular port type. Defines the interface and the binding style. Port – a Single endpoint defined as a combination of a binding and a network address. It defines the address or the connection point to a web service. Added further semantics to the description language.